Glass's Etudes explore his familiar musical fingerprints, and Meijer's arrangements remain faithful to the originals while creating highly effective and idiomatic pieces for harp. Colour contrasts between pieces place the quiet mid-upper registers of Etude No. 5 against a deeper and more wide-ranging Etude No. 8 that grows its harmonies from the lower strings. Each performance has its own inner energy and there is no vapid strumming, the rhythmic character of every Etude being used to create a propulsive momentum. There are nice surprises thrown in here and there like the gaudy music-hall intermezzo that interjects in Etude No. 17, as well as moments when you think you're hearing a guitar, or of are about to embark on something by Mozart as with the opening of Etude No. 12. All in all, CD 1 is a good listen and a great achievement - adding a good chunk of additional repertoire for harp players everywhere. Meijer keeps things appropriately dark for Glass's famous music for the film Koyaanisqatsi, but such an arrangement serves more of a reminder of the distinctive original than a significant stand-alone piece. 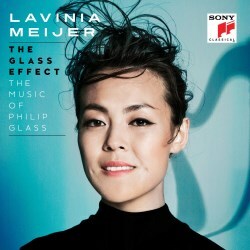 The collection of pieces on the second disc for this release forms the basis of 'The Glass Effect', showing where minimalist influences shine through in other composers’ work. Bryce Dessner's Suite for Harp uses limited rhythmic variety in streams of notes but takes us on an attractive harmonic journey with plenty of magic in its fragrant progressions. Nico Muhly explores atmosphere in Quiet Music, setting up a harmonic 'chamber' into which musical features are thrown like pebbles into still water. A Hudson Cycle sets up a two-against-three rhythm with interruptions, using plenty of added notes to give richness to his chords. Olafur Arnalds is appealingly traditional in the slow poignancy of his Erla's Waltz, the quiet expressiveness of Tomorrow's Song also has a timeless feel. Nils Frahm has a good feel for cyclical harmonies, and in different ways both the flowing Ambre and the more block-like chords of In the Sky and on the Ground take us to places of reflection. Ellis Ludwig-Leone's Night Loops adds electronics to the pallet, enhancing the harp with a subtle range of vocal and percussive elements to bring us somewhere exotic and potentially groovy, though the latter sets up a cautious beat that doesn't really go anywhere until the syncopations of the final minute or so. The final track, Lift Off, further investigates the potential of Koyaanisqatsi, this time with an added back-beat and some transformations of the harp sounds to create something with a refined but contemporary identity. This is a well-produced and superbly performed recording that has plenty to offer both to harp fans and those who have yet to dip their feet beyond Mozart's K299. There is certainly nothing scarily modernist here, and 'The Glass Effect' certainly seems to have more mileage than the Einaudi effect.